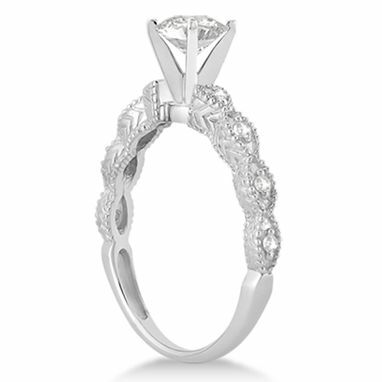 A total of 8 pave set diamonds are showcased on this 14kt White Gold engagement ring setting. This side stone accented heirloom ring features milgrain edges, filigree (scroll work), and marquise shapes. The brilliant-cut round G-H/VS diamonds sit on both sides of a prong mount with interchangeable heads. Design your own engagement ring with a center stone of your choice carat weight and shape. 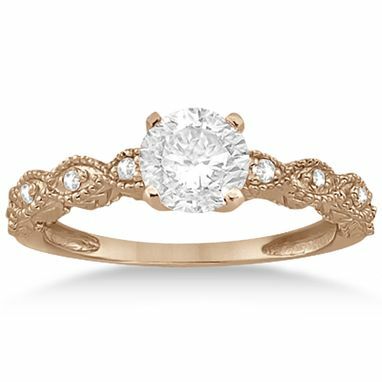 This vintage inspired bridal ring is also available in other metals. A matching band is also available.